A food blog that I started on a lazy afternoon as a way to keep my sanity in check (letting go of an almost decade long career to care for your firstborn baby is natural right?) means so much more to me now. If there is something that I think of non-stop (other than my little girl and my husband or my family) and even just before I fall asleep, it is none other than this blog. Sometimes or most of the times my eyes and my mind are filled to the brim with dreams for this blog that I just can’t fall asleep! Just Home Made has consumed the creative better of me and keeps my soul alive..
From an inconsequential beginning with my first post, from the first few hither-tither comments on the blog or the first few extra hits, subscribers, Twitter follows and Facebook likes, from knowing that somebody’s ‘search results’ landed them on my page to getting to know so many of you lovely bloggers – sweet, helpful and kind, to meet Helene in person at her photography workshop it has been an amazing roller coaster ride with butterflies in my stomach when I check the site stats, heart beating faster on reading your comments, adrenaline rush when phone buzzes over a tweet mention or message, a contended smile on my face when blog photos get featured on various sites and everything in between I failed to express here..
For all those beautiful moments of joy and whatever Just Home Made is today, I owe it to you from the bottom of my heart, Thank You! Don’t underestimate the power of your words, they bring a million dollar smile to my face (ask my husband)! So anytime you are here, don’t forget to say hello or you dropped by, I’d love to hear from you! There, I got it off my chest.. So, in my sheer excitement, I bring you in this post a GIVEAWAY and an elegant fruit tart while still trying to bid summer a grass-fire good-bye here in Texas. Baking was completely alien to me all my life until I started blogging. Much like a bewitched window shopper on Rodeo drive, gaping (with almost mouth wide open!) at all the luscious desserts and baked goodies on food blogs luring with drop dead gorgeous photographs or mouth-watering recipes, sparked an inextinguishable fire in me to turn on the oven. 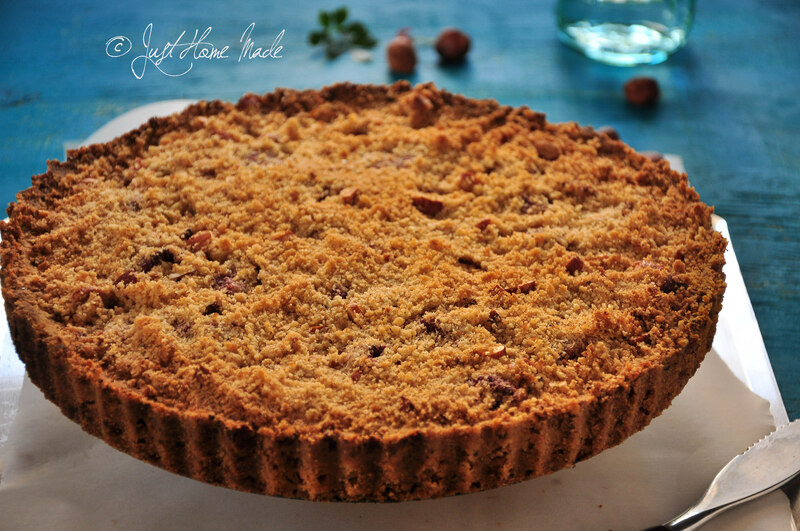 From being a baking lay person who couldn’t make out a thing between why baking soda and why not baking powder to brave it all and try a hand at baking a pie and this tart from scratch, all brownie points must go to blogging! Among all things baked, I must say that I am not just a wee bit but totally and completely partial to fruit desserts . So, little surprise to see this fruit tart making it for my blog’s birthday celebrations. 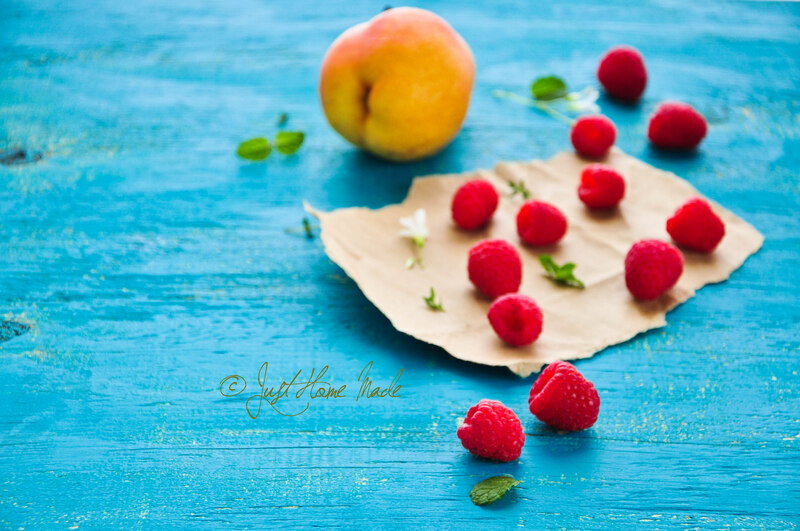 My love for summer fruits like cherries, berries and stone fruits is timeless and I have left it to be no secret either on many of my posts earlier. Pears however come a close second and amongst the different pear varieties, I particularly enjoy snacking on Seckel and Red Anjou pears. When I was on the lookout for a good fruit dessert, I realized that Pears were a neglected lot in comparison to the lion’s share of baking limelight berries and stone fruits devour. And that’s quite the reason I chose a shy and silent but full of character Pear and paired it with the beautifully ruby pink and sublimely flavorful raspberries, just for the fun of walking the less trodden path or so I think! The original recipe called for Macadamia nuts and a 11 inch fluted pan. I had bought a 10 inch pan with great enthusiasm, so I stuck to it even though the recipe quantity is more for the size of the pan. Just pat an extra cookie or two with extra flour mix like I did. Verdict? The tart was delicious with a mild raspberry and pear flavor burst in between. But I also see why these are a rare sight compared to the stone fruits. Unless I knew Pear was in there, I am left with just an indistinct sweet juicy fruit flavor. Nonetheless, it made for a lovely fruit dessert for the first try. Now, let me come to the part that interests you most – the giveaway! One of my friends and neighbor PG started out as a Tupperware Consultant recently. After attending her Tupperware party and a preview of some cool products, I got the perfect idea for the giveaway. I get to give some business to my friend and also give away something nice to you lovely readers as my token of appreciation for all the boundless love and support you have given me so far. If you are like me who loves to organize (rather organization obsessed! ), then you will surely like to own these cute storage containers. Cute and utilitarian, they come in handy to store anything from spices in the kitchen to buttons, thumbtacks or tiny knickknacks around the house or to go in a lunch box. TUPPERWARE products are not sold in stores, only through consultants and online. Giveaway is open to residents of USA. If you live outside of US, but can provide an US shipping address, you are eligible to participate too. Leave a comment on this post telling me what you like or dislike about Just Home Made or what you would like to see here in future or any other suggestions for improvement. One winner will be chosen based on a random draw. Will contact the winner for the shipping address once announced. Read the full recipe before starting. To start with, roast hazelnuts and almonds. To roast the hazelnuts, microwave for about 2 minutes in 30 sec intervals until fragrant. When cooled, pulse it in a food processor or coffee grinder or mixer until the mixture resembles a coarse meal. Pulse more and you will end up with hazelnut butter. Roast almonds the same way. Chop into bits when cooled and keep aside. Wash the pears, pat dry, peel, core and slice into thin rounds about 1/8th of an inch. Squeeze lemon juice over the pear slices (to keep them from browning), mix well and set aside. In a large bowl, combine flour and sugar; cut in cold butter and either mix well with your fingers or process in a food processor (I did the former) until mixture resembles coarse crumbs. If you see pea sized butter blobs here and there, it is fine. Stir in hazelnut meal. Gently press this flour mixture onto the bottom and up the sides of an ungreased 10 inch fluted tart pan with removable bottom. In a large bowl, combine the pears, sugar, cornstarch, cinnamon and lemon zest/extract. Add raspberries and toss gently. 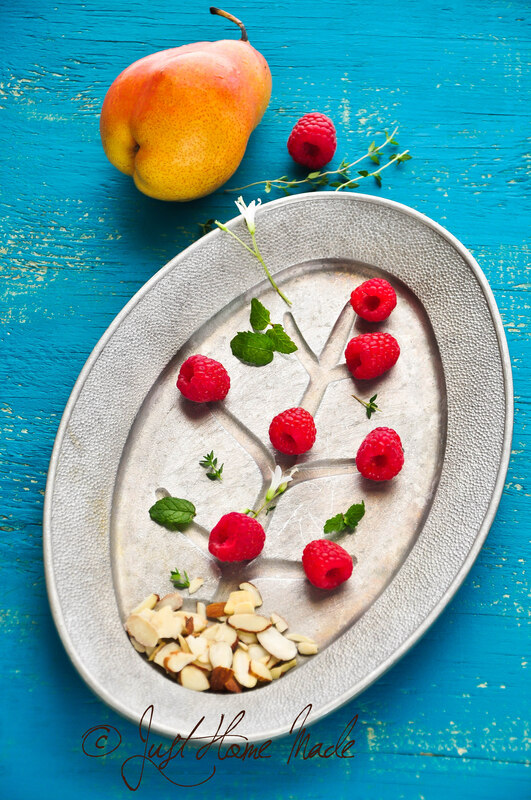 Carefully lay out the fruit mix on to crust filling empty spots with raspberries. Bake at 425° for 25 minutes. In the meanwhile, for the topping, in a small bowl, combine the flour, brown sugar and lemon zest; cut in butter and mix until crumbly. Stir in chopped roasted almonds. Sprinkle over filling. Bake 15-20 minutes longer or until filling is bubbly and topping is golden brown. Cool on a wire rack. Refrigerate leftovers. Tastes best served warm by itself or served with honey yogurt or even an indulging rich vanilla ice cream with some raspberries on top. Do not overly press the four mixture onto the tart pan or it will result in a hard tart crust instead of crumbly. Instead of washing the raspberries as they become soggy, just wipe them with a soft wet cloth or tissue. You can core the fruit even if you don’t have a corer. Insert a (vertical) peeler at the bottom end of the pear and rotate clockwise and anti-clockwise once each or until the core comes out. If you happen to make the flour mixture for the tart crust before slicing up the fruit, do not fret! “Carefully” place the tart pan (remember the pan bottom can move) on a baking tray and put it in the refrigerator until the filling is ready. Since the flour mix is dry and crumbly, tart crust can shatter easily at this point. Be very careful when taking the baked tart out of the removable pan to place on the cooling rack or it might break. 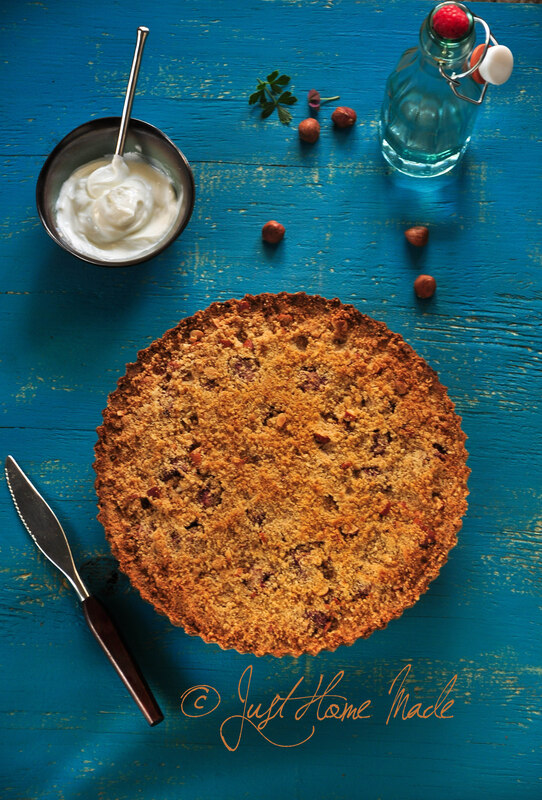 If you can’t find Hazelnuts, they can be safely substituted with almonds without much damage to the recipe or taste. Microwave leftover slices for about 30 secs before serving. Happy Blog Birthday Radhika. Here’s to many more delicious years to come. The tart looks delicious. Great clicks. hi Radhika- congrats on your blog baby turning one- it’s indeed a beautiful feeling ! wishes for many more such heartwarming milestones. The thing I most love about ur blog is not only the stunning pictures but also the funky narrative you bring to the table. Just rock on. 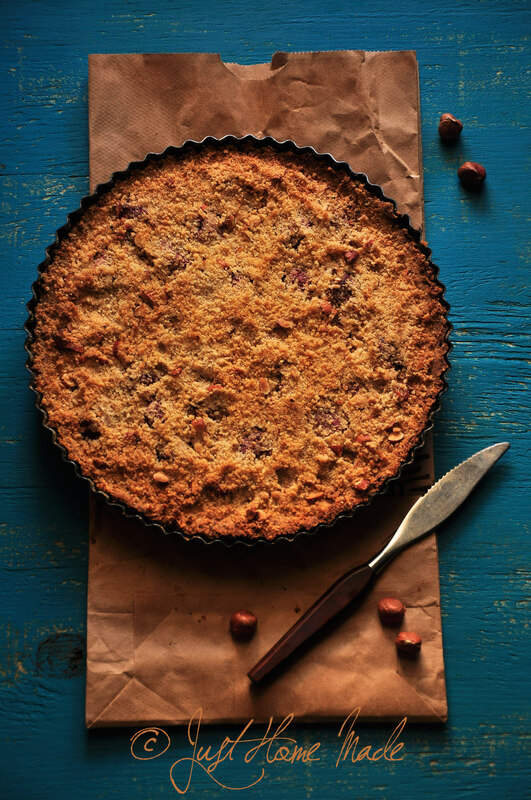 Tart looks just yum & a great giveaway;thanks for spreading cheer.My Sister-in-law lives in Milwaukee and it would be a lovely suprise gift for her ! What a wonderful crusty tart, Radhika! And congrats for blog anniversary. I think your photography is fabulous! Congrats on the one year anniversary. A hazlenut crust? I am so intrigued. This recipe looks divine. Congratulations Radhika for your blog anniversary! Your recipe looks soooo divine and your pictures are making me drooling here! I wish I could grab a slice from my screen. Can’t wait for that technology to arrive…hahah. Jokes apart, Congratulations again for your fabulous blog! Dislike? No way! My favorite thing is the photography, hands down. Simple and striking. And, I love how you use color so beautifully. You have a beautiful blog with beautiful recipes wonderful photographs and a ever prettier heart.. keep going 🙂 Happy Birthday to your baby Radhika! Congrats my dear, I definitely love the photography and would love to see even more gorgeous pics! I tweeted and follow you as well of course! Happy Birthday to your blog, Radhika. Finding a creative outlet and a passion for it is probably one of the most rewarding things ever. Blogging opened up so many different things for me in terms of food, learning about different cultures, photography and most importantly, many friends. Wishing you many more blogiversaries! Happy blog birthday Radhika!!! 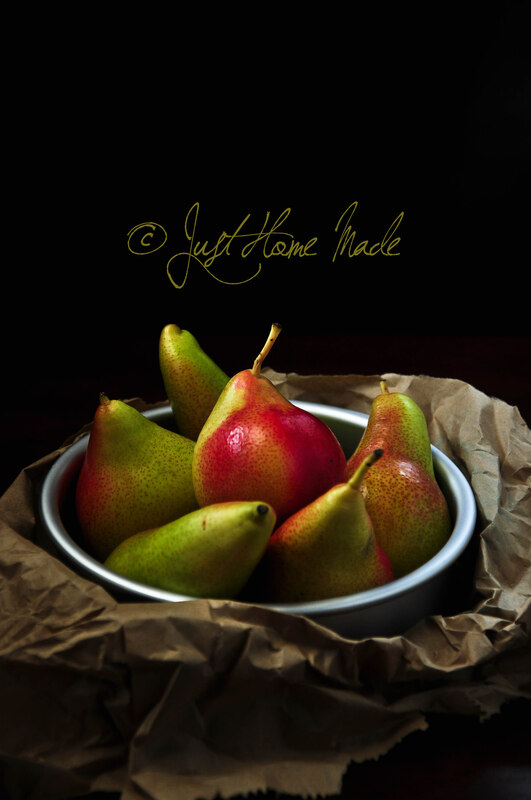 Your raspberry and pear tart looks amazing….and wow, that photo of the pears is SO beautiful!!! Hey Radhika, Many Many Congratulations!!!! on the first anniversary of your blog. “Just Home Made” is “JUST PERFECT”, JUST AWESOME”. What more can I say? I just love the excellent presentation. Can you post a recipe of Vegetable Stew? Congratulations on reaching this wonderful milestone…what a grand way to celebrate. I have a soft corner for fruit bakes and this has me intrigued! Love the pairing, and ten of course the hazelnuts in the pie shell. YUM!! I love your site! I love all the beautiful pictures and mouthwatering recipes! I wouldn’t change a thing- just keep doing what you are doing! Wow, this is such a beautiful tart. And your photography is also very beautiful. A wonderful blog , wonderful pictures and equally wonderful recipes. Keep up the good work! I also found your Facebook page. Happy Blog Birthday Radhika.Have been a silent reader of your blog.Found your blog from my close friend shalini and have been hooked ever since.I have also tried your lemon rasam and mango thokku and they turned out delicious. 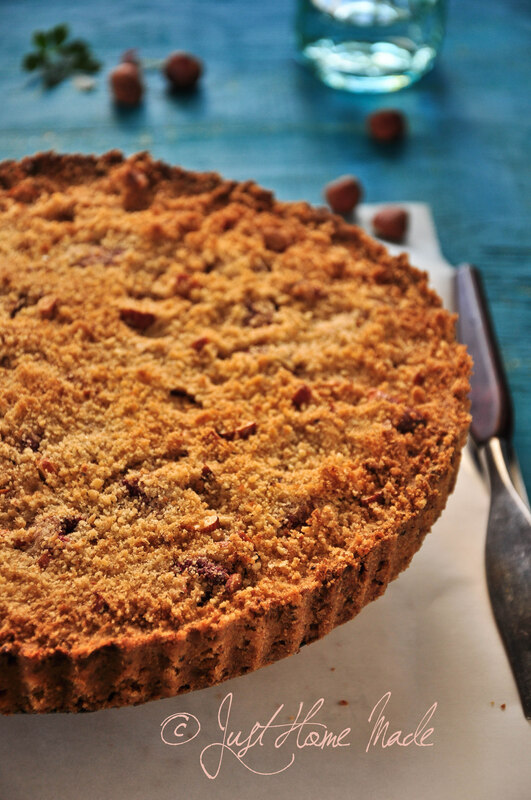 Love, love , love the recipe of this tart! This is a recipe for me to try. I always have hazelnuts on hand. Great pictures. You can tell that you had a great teacher. I read Helene’s book daily. It is wonderful. Oh, Congratulations on your blog’s first anniversary. Congratulations on your anniversary!! Your blog is such an inspiration not only because of the photography, but also how you weave your stories and recipes together seamlessly. Plate to Pixel was an awesome book and I’m so jealous you got to attend that workshop. I saw pictures of it somewhere and thought, how lucky you all were!! Your hard work really shows and your pictures are so beautiful. Jamie, I thought I very much got lucky too.. it was fantastic learning from Helene herself.. thank you for stopping by to wish..
Love ur recipes and all the pics are too stunning. As for this recipe……what can I say…..can I have a piece plz? ?…Its super tempting. I just stumbled across your blog, just in time for a giveaway, lucky me! As I scrolled down your posts I of course love your photography, but I also love how much variety you have in your recipes. I can’t wait to explore the whole site, and visit daily—congrats on your 1 year anniversary! I love ur pictures!!! That’s the most coolest thing (next to the recipes of course)….I also liked u on FB! Your blog is a visual treat for all 5 senses! Keep up the good and beautiful work. Many thanks to each one of you who took the time to stop by and wish and even all those of you who really wanted to but couldn’t.. It is you who make this blog special!